Though the Sunrisers had a good bowling unit consisting of Steyn, Boult and Bhuvaneshwar kumar, the Chennai Super Kings, by far arguably the best and most consistent team in the IPL and other t20 leagues, entered the match as favourites and proved it with no doubt whatsoever! Here’s an insight to the game. MS Dhoni, the Super Kings skipper elected to bat after getting his call right at the toss. It was later proved correct after a batting masterclass at the MA Chidambaram Stadium, Chennai. The attacking Chennai openers, Brendon Mcullum and Dwayne Smith, came out to open the innings for the Kings. They got what all teams want at the begining- A Perfect start. The openers laid down the strong foundation that lead them to a huge score as the first wicket only fell after the team amassed 75 runs in 8 overs. Dwayne Smith, the West Indian opener was the batsman to depart being run-out by the speedster Trent Boult.But at the other end, the Kiwi skipper, Brendon Mcullum was looking in good touch continuing from where he left the World Cup. Suresh Raina, the No.3 came in. He had a good opportunity to score as the foundation had already been laid by the openers. However, his stay in the middle was not long, he only scored 14 runs off 12 deliveries. His run-out meant the Kings were two down at the score of 135 after 13.3 overs. MS Dhoni, one of the best finishers in world cricket at the moment took the right call as he promoted himself up the order, similar to what he did in the 2011 World cup final, coming in at 4.This decision turned out to be an important one in the game. Mcullum was holding one end securely as the Hyderabad bowlers were all at sea, being thrashed to all parts of the ground. MS Dhoni gave charge right from the word “GO” as he quickly brought up his half-century in just 28 deliveries before falling to Boult. 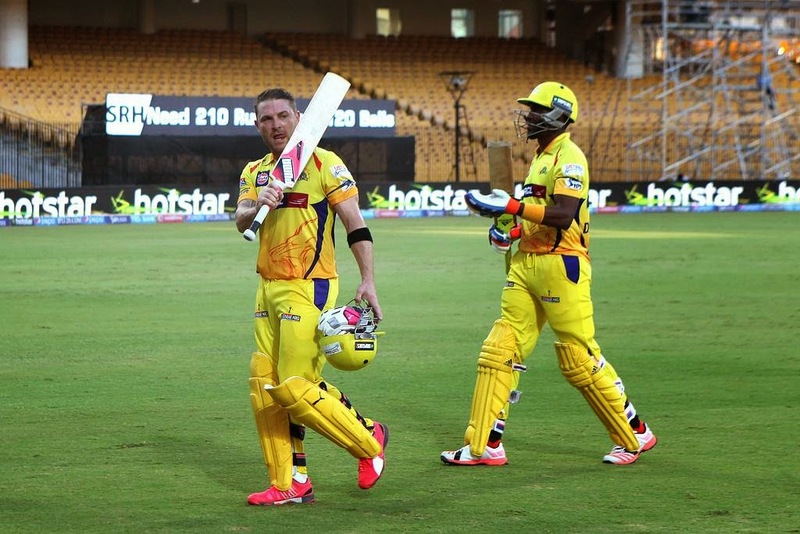 But the wicket hardly set them back as Mcullum scored his second hundred in the Indian Premier League. After 20 overs, the Kings posted a hefty total of 209 for the loss of 4 wickets. 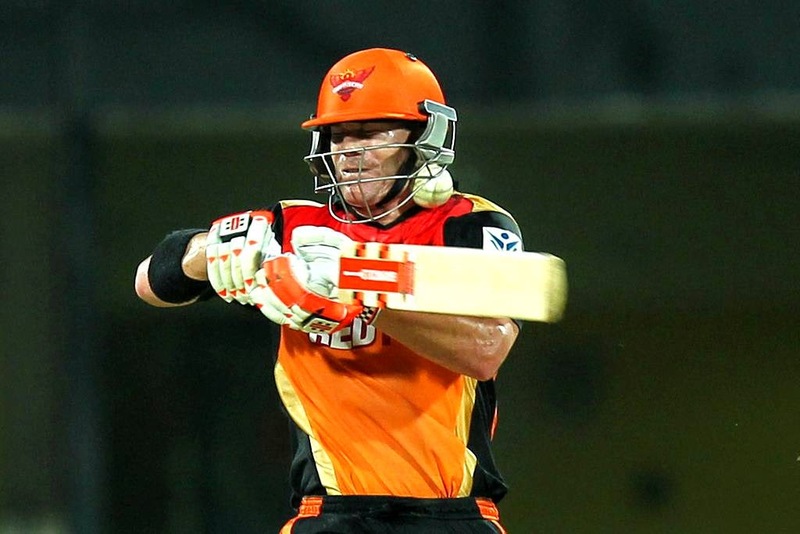 The Sunrisers had to emulate the same batting show to give themselves a chance in the game. The two elegant left-handers in Shikhar Dhawan and David Warner came out with a huge task to be accomplished. Their batting was not as good as their counterpart, which was the initial dent in their confidence and self-esteem. However they both showed no signs of that, scoring 10 already off the first over bowled by the India discard, Ashish Nehra. Shikhar Dhawan looked threating at the beginning but gave his wicket too early in the game, playing a bad stroke. He fell with 30 runs on the board of which he contributed 26. Lokesh Rahul, the recent member of the Indian Cricket team that toured Australia came in to join his skipper Warner who looked a bit defensive, not quite the Warner we see every day. But the young lad could hardly stay out there as Mohit Sharma got him with the team score moving up by only 16. Naman Ojha, the wicketkeeper was the new one in. He squandered his wicket under pressure only managing 15 runs. The match was slipping out of the hands of the Sunrisers. Just then, Ravi Bopara, the English all-rounder walked in after a good Big Bash League season and decent performance at the World Cup. Warner and Bopara brought some hope to the fans, but thatwas also later diminished as Warner and Bopara fell in succession.The rest of the batting never worked except for Kane Williamson and with this the Chennai boys registered their first win in the season. In Mahendra Singh Dhoni’s words “All three departments clicked together”. Brendon Mcullum was adjudged the Man of the Match for his magnificent and entertaining 56-ball hundred. After all, that’s what IPL is for: entertainment. Chennai Super Kings keep their IPL record perfect as they top Sunrisers.